Seventeen hours and 1,013 miles later, we have successfully made it back to our ol’ Kentucky home. The trip was pretty good and the most eventful thing that happened was a massive, loose and rank bowel movement that Drew made shortly after making a stop. Diaper changes don’t normally cause so much stress, but y’all just can’t appreciate how laborious it is to change a diaper, much less a diaper with at least a pound of….substance oozing out of the sides, on a 5-year old kid whose legs have very little to no movement. Take into account that we had to do it on one of those flimsy diaper changing stations at a McDonald’s which may or may not even safely accommodate a child of Drew’s weight including medical equipment and doesn’t provide the space needed to do so. Y’all really just need to change one of Drew’s diapers to understand why I go on about diaper changes. It’s such a task that I don’t even know if it would be morally appropriate to ask anybody to babysit Drew for the guilt and worry of them having to go through that. Oh yeah, my husband would be upset with me if I left out the fact that despite Nathan’s valiant and meticulous efforts, the wind managed to shred the edges of a tarp transforming it into thousands of individual threads just like one had taken a comb and undid all of the weaving. We think we lost a couple of pieces of one of Drew’s toys and the contents of the bed of the truck had to be rearranged at least once and Nathan wearily checked our load frequently during the entire trip. Drew was a little more excited about the snow than I was. It has done nothing but snow since we’ve gotten here. Not much of it sticks, but the fact remains that it’s freakin’ cold outside. I went from wearing shorts and flip-flops to jeans and sweaters and those bulky winter jackets. But, Drew was not bothered by the cold weather. 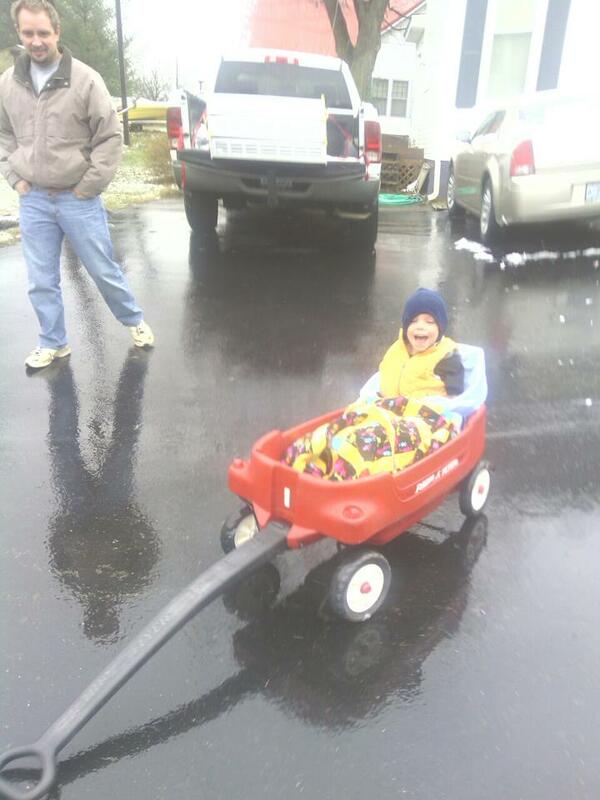 Even though there was no snow, it was extremely cold outside and letting momentum carry him down in his Radio Flyer wagon down a slight decline in our driveway satisfied his desire to go sledding. Drew is having a great time at home. He has been reunited with his ol’ buddy Sarge, our lab. And, since Drew’s been away from home for six months, the house feels like a toy store full of new toys since he hasn’t laid eyes on them since September. He should be good and occupied for a while! Me, I feel like a stranger in my own house. I can’t remember where anything is. I have to look in 2-3 drawers and cabinets when looking for glasses, plates, silverware, etc. I’m constantly asking Nathan, “Where do we keep the blankets?” and “Where are the paper towels?” I can’t even remember when trash day is. It’s definitely different being in a house as opposed to being in an apartment. Our apartment is less than 900 square feet I think so even when I was in the kitchen, I could have a normal conversation with Drew in the living room with only a kitchen bar between us. Even from the bedroom or bathroom, Drew was in immediate reach of me. But, now I have a long hallway and a dining room between the living room and kitchen, many more walls to absorb our yelling. We have half of the water pressure which is a definite downer. But, I only must walk our trash to the corner of our driveway once a week instead of across a complex which is nice. I’m having to relearn how to use our remote control and cable provider. And, the front porch and gutter has just disintegrated through some severe weather a while back. We can’t just call apartment maintenance to come do repairs at no charge to us. No, we have to use our tax money for a new roof. Just like when we started packing in preparation for our return to Kentucky, we are overwhelmed with piles of packed boxes and crap to unpack now that we are here. Nathan and I just stood back, eyes wide and just wanted to melt away trying to figure out how to get started. We’ve spent the last two days organizing and cleaning and separating things to a “yard sale” and “keep” piles. At one point I think we both fantasized about just burning the house down and all of its contents and starting over. (I’m going to be in big trouble, I think, if our house actually happens to catch on fire now. How is that going to look now?) And, the icing on the cake: we have to do it all over again in the summer when we return for good. Oh joy! But, really, I’m glad to be back. I’ve reunited with a couple of friends already and look forward to seeing others. I get to have fun completing my checklist of things I can’t enjoy in WPB like the fried crawfish dinner at The Feedmill, wings and pizza at Firedome, the chicken strip basket at Dairy Queen, and salsa and chips at The Mexican Restaurant (you may have noticed all of these include food. Well, don’t forget: I am pregnant.) Although coming home to my office with all of my work notes and work station related items made me really sad. I even nostalgically peered into the windows of the center (when I worked in the center as opposed to working from home) as I drove by the other day. But, most importantly, being home has made it very clear how close we are to being done with all of Drew’s leg surgeries. The only surgery we have left is to remove the fixator. It’s just around the corner and to be this close to the end is very comforting. I finally feel hopeful. I can just about see the end of this. This has drug on and on since May 2012, nine months. At times it was so hard that I fought back tears. Felt defeated and lonely. Doubted what we were doing. Regretted it. Just wanted to give up. But, we’re almost done. Sure, physically therapy is going to be long and tough, but the exciting part will be to finally see the rewards via standing and walking. That’s when the year of surgeries will finally pay off. Things are already improving. Since Drew’s most recent surgery, Drew has no pain and hasn’t taken pain medicine in a day and a half I think. He’s moving his legs: crossing them, kicking (his brace leg), and even showed us how he could do the splits. Before, he hardly moved his legs at all and his right knee was so sensitive he’d complain at the slightest pressure or bend. But, without the pins, he’s a completely new Drew. Even his shower last night went off without so much as a single whimper. That’s just about the first shower in six months that wasn’t 45 minutes of screaming or pained whimpering. And, when the fixator comes off, he’ll be even better. Only 12 more weeks.